Radio Tupi's director Helio Ribeiro (1964-1965) congratulates Barros de Alencar, the most popular DJ at the station (from 1964 through the late 1970s). 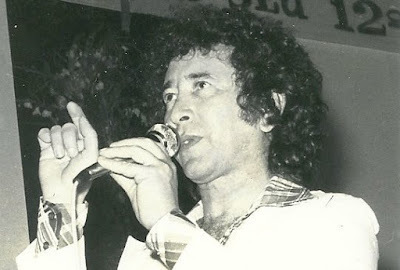 Cristovão Barros de Alencar was born on 5 August 1936, in Uiraúna in the Northeastern state of Paraíba. He left home early, first going to school in neighbouring Patos-PB, then to Campina Grande-PB where he worked as a commercial speaker at Radio Borborema. When he was 18 years old in 1954, Barros moved to Recife-PE where he was supposed to go to law school. He never became a lawyer but got a job at Radio Nordeste in Natal-RN in which he presented 'Clube do radio-fan'. In 1956, Barros was at Radio Poty presenting 'Jornal do fan'. Next year, 1957, Barros had moved south to Belo Horizonte where he worked at Radio Guarany and produced programmes for TV Itacolomi. From Minas, Barros moved south to São Paulo where he found a job as a commercial speaker at Radio Panamericana. By 1963, Barros had his own show, 'Revista musical brasileira' at Radio Tupi, albeit it was in the so-called 'grave-yard slot', from 23:30 through to 1:00 AM. Barros though was at the right place at the right time. In mid-1964 Emissoras Associadas signed radio whiz-kid Helio Ribeiro to overhaul Radio Tupi which was lagging in the ratings. Ribeiro following radio man Kalil Filho's advice gave Barros the late morning slot - from 10:00 to 12:00 AM. 'Só sucessos' went from strength to strength and made Alencar popular overnight. Radio Tupi shot to the top in a matter of weeks and stayed there for a few years. Helio Ribeiro left the station, but Barros stayed put for more than 10 years. From his seat at Radio Tupi he established himself as a major radio personality. Anyone who ever listened to his late-morning show can still remember the jingle that was played at the last half-hour: 'Barros de Alencar vai apresentar as 7 mais do dia, as 7 campeãs!'. 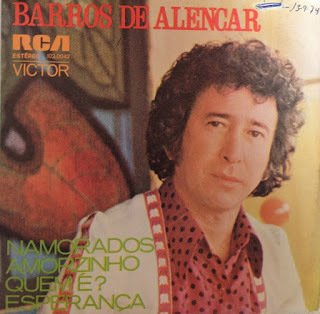 Mr. Alencar also kept a career as a recording singer. His RCA discs played only at his shows but soon started to have a more widespread appeal having reached its peak in 1975 when he had a big hit with 'Emanuela', a cover of the French novelty tune. Barros de Alencar died on the first hours of 5 June 2017, in São Paulo and was buried at Cemiterio Primavera in Guarulhos in the afternoon of the same day. Revista do Radio n. - 11 May 1963. Barros MCed 'Revista musical brasileira' starting 23:30 through 1:00 AM - the so-called 'grave-yard slot'. Revista do Radio n. 810 - 27 March 1965. Barros tells part of his story since he left his home town. For some reason he fails to mention he made a 'pit-stop' in Belo Horizonte-MG though. Barros de Alencar with Wanderley Cardoso, Bolívar, Genival Melo & Rinaldo Calheiros. Barros de Alencar and Amilton Fernandes, who also had a daily programme at Radio Tupi. Amilton shot to instant celebrity when he played Albertinho Limonta in TV's remake of Felix Caignet's 'O direito de nascer' (The right to be born) so he had to leave off the radio show. In this Revista do Radio piece, Barros says he had two sons: Sergio Francisco and Cristovão Barros de Alencar Filho. He didn't mention the existence of a wife though. actor-speaker Amilton Fernandes records an album of Barros de Alencar's chronicles. 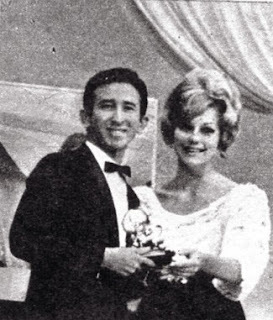 Barros de Alencar gets his Roquette Pinto for best DJ from actress Marcia Maria in 1965. 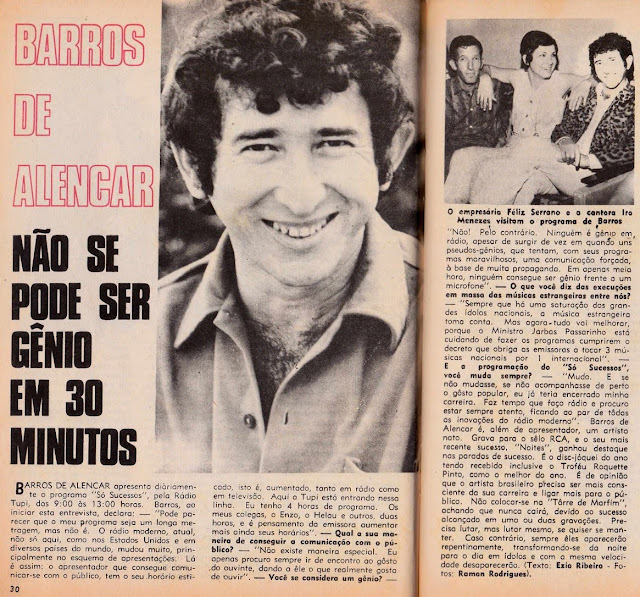 By 1969, after 5 years on top at Radio Tupi, 'Só sucessos' stretched from a 2 to 4 hour-programme. Barros talks to 'Melodias' about radio programming. in the 1970s Barros made inroads into TV having signed with TV Record to MC a weekly Saturday bash. He also increased his phonographic releases by RCA Victor.